Cochabamba is a city in central Bolivia, located in a valley in the Andes mountain range. It is the capital of the Cochabamba Department (province) and is the fourth largest city in Bolivia with a population of nearly one million. The population in the highland part of Cochabamba is largely Spanish speaking, though there are a significant number who speak indigenous languages such as Quechua and Aymara. The name Cochabamba comes from the native language of Quechua, meaning "a plain full of small lakes." As Bolivia is particularly rich in petroleum, Cochabamba has benefited as a center for oil refinery, while the city's industries also include food processing, chicken farming, and furniture making. Its climate is relatively mild, permitting extensive agriculture including grains, potatoes, and coffee in the highlands and sugarcane, tobacco, and fruit in the Chapare lowlands of the Amazon. The Chapare region is also one of the country's main coca-leaf producing regions. Bolivia received international attention in 2000 when extensive protests broke out in Cochabamba during what has become known as the Water Wars. The protests were in response to the government's decision to privatize the city's municipal water supply. Access to clean piped water was already an issue, with an estimated fifty percent of the city lacking this service, so Bechtel Corporation's introduction of increased rates by 100 to 300 percent effectively put water out of reach for the city's poor. It was the way in which the the collection of rainwater was policed and penalized however, that brought citizens to the streets in masses. 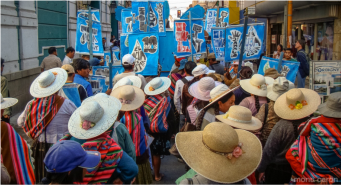 The waves of protests paralyzed Cochabamba and eventually Bechtel abandoned its monopoly in Bolivia.